Open Daily. The entrance fee for divers is 15 USD. Toilets are available. There is a small parking area but no tables to set up dive equipment. Access to the cenote is via a short walk from the parking area to a fairly steep set of stairs that leads down to a small platform at the water. Zapote has a maximum depth of 63m/208ft but the maximum depth allowed for Cavern Diving is 40m/130ft and we will stay within this limit. Halocline depth 30m/100ft. Cenote Zapote is named after the Sapote (from the Nahuatl “tzapotl”) trees growing nearby. The Sapote is an evergreen tree native to southern Mexico measuring about 20m /70ft tall which are cultivated for their soft edible fruits, the medicinal oil obtained from their seeds and their wood. The Kin Ha property includes three Cenotes which can all be dived; Zapote, Hol Box and Kin Ha itself. Zapote and Holbox are the star attractions, Kin Ha although not as spectacular is still worth a dive. Zapote has quite a long drop from the land surface to the water surface of 6m/20ft but access is easy via a set of stairs. 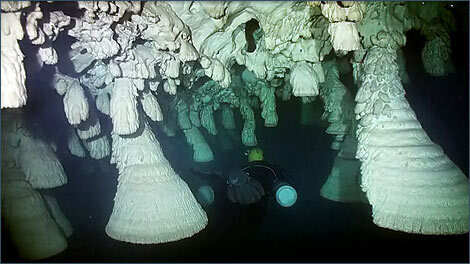 Zapote is another sinkhole cenote with the typical hourglass profile. Floating at the surface in the roughly circular pool the sheers walls rise above you like the ramparts of a fortress and once you start your descent they get progressively narrower until a depth of 20m/66ft before starting to open back up again.